Random Ramblings of a Demented Doorknob. : THE AVENGERS. It started with Iron Man in 2008, and then The Incredible Hulk soon after. From there we received Iron Man 2, Thor, and Captain America, with the characters of Nick Fury, Agent Coulson, Black Widow, and Hawkeye sprinkled throughout. For 5 years, Hollywood has been building to the moment when these characters would assemble together to form The Avengers. There's been skepticism and excitement leading to this moment, a lot of it centered around director Joss Whedon. With so much build up, so much hype, so much anticipation... could it possibly have been any good? This time, Loki (Tom Hiddleston) wants revenge for his banishment by his brother Thor (Chris Hemsworth) by taking over the Earth realm. With the help of an alien race, Loki goes after the Tesseract, a dangerous energy cube that could destroy the entire planet alone. So now Nick Fury (Samuel L. Jackson) must once again attempt to assemble the Avengers to help stop him. 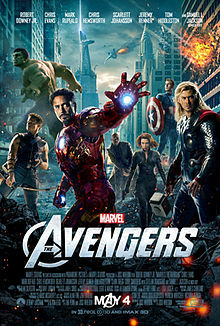 They go for the wisecracking genius with a suit of armor, Tony Stark/Iron Man (Robert Downey Jr.); the super-human soldier from the past, Steve Rogers/Captain America (Chris Evans); the gamma-radiated scientist who might be the only one who could find the stolen tesseract, Bruce Banner/Hulk (Mark Ruffalo); and then include his own agents, the Natasha Romanoff/Black Widow (Scarlett Johansson), Phil Coulson (Clark Gregg), Maria Hill (Cobie Smulders), and Clint Barton/Hawkeye (Jeremy Renner). The biggest question of everyone's minds was... how can Joss Whedon pull off such an ensemble cast battling for screen time? Surely some were going to be left out more or left underdeveloped; he couldn't possibly give equal time to all of these characters and still have a good and/or cohesive film. But I guess these people don't watch a lot of Whedon, because thats basically one of the things he does best. While I was watching, I kept wanting to say "Oh, RDJ is stealing this movie." But then 10 seconds later, it'd be like "Oh, The Hulk is stealing this movie" and then "Oh, Scarlett Johansson is awesome in this," etc. Of course, Whedon's not a moron. He played up fan favorite Tony Stark, giving him some of the best lines. Everybody has their highlights in this movie, though. Jeremy Renner comes closest to being left behind, but the reason is pretty obvious--he's the least known of the bunch. He builds him up just enough to keep an interest in him and make him cool, but Whedon doesn't put a ton of focus on him; he keeps that on the characters the mainstream audience actually already know and want to see. The biggest surprise, though? The Hulk. After two incarnations on the big screen (one terrible, the other decent), I think Whedon finally hit the nail on the head. Ruffalo's Banner is solid, and the Hulk itself looks good and has some fantastic moments in the third act (actually, he probably has the two of the best moments in the entire movie). Speaking of the third act... has that not been the bane of the pre-Avenger movies' existences? It seemed every time, we were all left underwhelmed by the "final boss battles." There was all the build up and then... short and not very exciting. But not this time. The third act is fantastic. The city-wide battle is outstanding, and Whedon makes sure every character has at least two or three moments to really shine. And yes, the final fight against Loki himself might be incredibly short, but it's easily one of the greatest moments in the entire film. I don't think there was a single person in the audience who wasn't laughing and cheering at that moment. Simply fantastic. Outside the wonderful action sequences (mostly in the second half of the film), there's a good mix of comedy and drama. And just like with the action, everyone gets a turn. There's the rivalry between Tony Stark and Steve Rogers; the bond between Black Widow and Hawkeye; the isolation and worry of Bruce Banner; the trusting of Thor amongst the Avengers themselves, as well as the relationship between Thor and Loki; and, of course, Agent Coulson just being the scene stealer that he is. Of course, at the same time, the scenes in between the action can be a bit slow at times, but the ones that drag never linger too long before something strikes your fancy. So in the end, I think it really worked. I saw it with a few other people, one of which hadn't seen any of the Pre-Avengers flicks, and he still really liked the movie. So I guess prior viewing doesn't necessarily matter, but I'm sure it definitely helps some of the deeper understandings of the characters and their past relationships with others. If you want to see a great comic book movie with awesome action and some nice comedy, check this out (if you haven't already). As a side note, I also saw this in 3D. It didn't hinder the movie whatsoever, but it's not totally necessary, either. It's, again, one of the more atmospheric types. So if you're wondering whether to see it in 2D or 3D, it doesn't matter one way or the other. The 3D won't hurt your experience, but it's not gonna blow you away, either. Anyway, I had a really great time with this, and I'm definitely going to check it out again. Having not seen Thor or Captain America, I actually found the opening thirty minutes a bit disorienting. It wasn't until The Avengers assembled that I was on board for this film. Whedon did do a great job of balancing all the characters and he's such a smart writer. As a director, I'm not too keen on his action sensibilities. I think those scenes are passable, but it's not stellar, which I think brings the film down a bit. Still, good to see Whedon's writing shine though. He makes the first Marvel film I've enjoyed in years, so big kudos to him for pulling it off. I can agree that prior to Thor's entrance, the film is a wee bit slow, but I didn't feel it was disorienting. Then again, I had seen all the films leading up to it. And I had absolutely zero problems with the action. I mean, yeah. I loved this movie to death. Whedon really is the star here. It's the biggest thing he's ever done, and he really does a superb job. All things considered, he really is the perfect choice for the movie. No one does projects focusing on the idiosyncrasies of teams better than him. I do disagree with you on the scenes in between the action being slow. Whedon is such a fantastic writer that those scenes were arguably more interesting. I particularly loved the one where Stark and Banner are talking about their respective "ailments". And the action is fantastic. And The Hulk, man, The Hulk!! You say the "final" battle with Loki was really short? I'd say that if it was any longer it wouldn't be as cool. The joy of that scene comes from his completely stunned expression after Banner destroys both his body and his ego. Perfect! Just perfect! Yeah, Batman better bring his A game if he's gonna top this one. I think you misread my Loki vs. Hulk statement. What I meant was that, while it was short, it was absolutely perfect (whereas in the previous films, all the final battles were short and... disappointing). Also, I've been meaning to ask this for awhile. How do you get the Reply option in your comments, cuz I cannot for the life of me figure it out. No idea. They just showed up one day on their own. I thought it was automatic for everybody. Figured it out. I didn't have them set to embedded. 50/50 Review #19: Escape From New York. V.G. Movies #19: Alone In The Dark. 50/50 Review #18: The Monster Squad. V.G. Movies #18: Resident Evil: Apocalypse. 50/50 Review #17: Lone Wolf McQuade.